This is truly a unique opportunity for an incredible diverse alpine and hill country hunt on a private 18,000 acre station with over 45 miles of private access to the Clarence River. Just north from Kaikoura this working sheep station has had Red Deer herds for over 30 years. about our Waiau-Toa Station - Red Stag and South Pacific Goat Combo package. With over 50 miles of road access on the property there is deer hunting available for all varieties of fitness levels. The opportunity to move around the property by four-wheel-drive and ATV's makes this a great hunt for those that are not able to do big hikes on a daily basis. Your professional Kiwi guides will host you in their home for a wonderful experience, and you will stay in a 90 year old refurbished farm house that has all of the modern amenities you would expect. The true highlight of any trip to New Zealand is getting a chance to meet the locals and this hunt will truly be an experience of a lifetime. You will leave with great hunting tales and newfound friends. 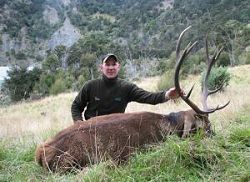 The above hunt packages are designed to be all-inclusive, leaving only taxidermy and expediting costs and New Zealand firearms permit application fee of $25.00NZD. Each hunter will have an opportunity to harvest a Trophy South Pacific Goat. In addition to these animals there will be opportunities to add additional game species to add to this hunt and pay direct to the outfitter at the completion of the hunt based on the number of additional animals that were harvested. Read more about and see photos of Waiau-Toa Station accommodations. See our photo gallery for Waiau-Toa Station. Download our flyer for Waiau-Toa Station hunting packages.